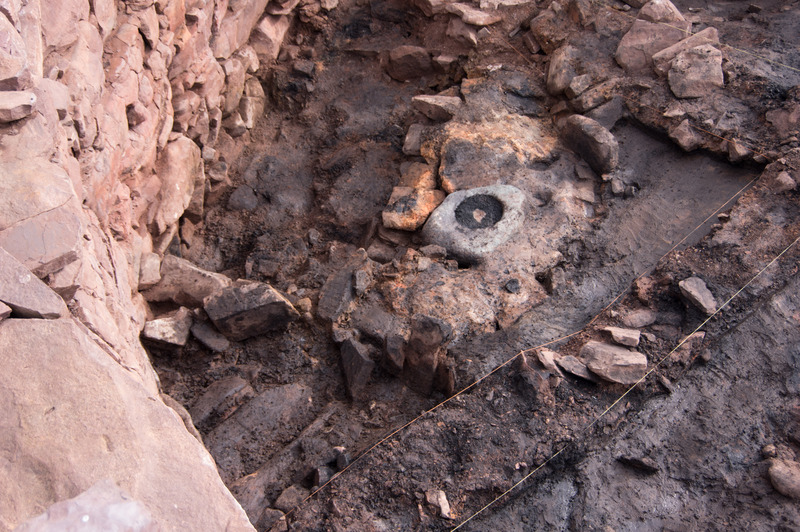 Above: the knocking stone in situ at different stages of excavation. 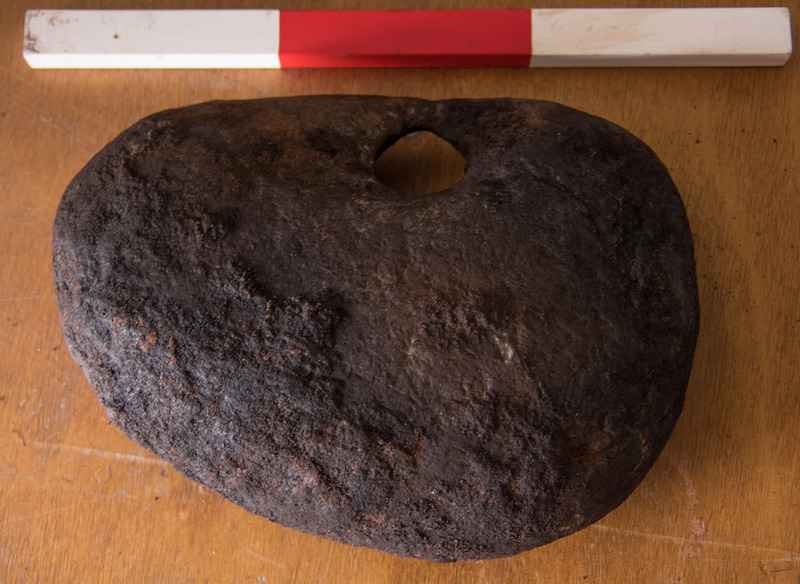 Perhaps the headline find was a rather amazing knocking stone, which is something I have only previously seen in some African tribal art. 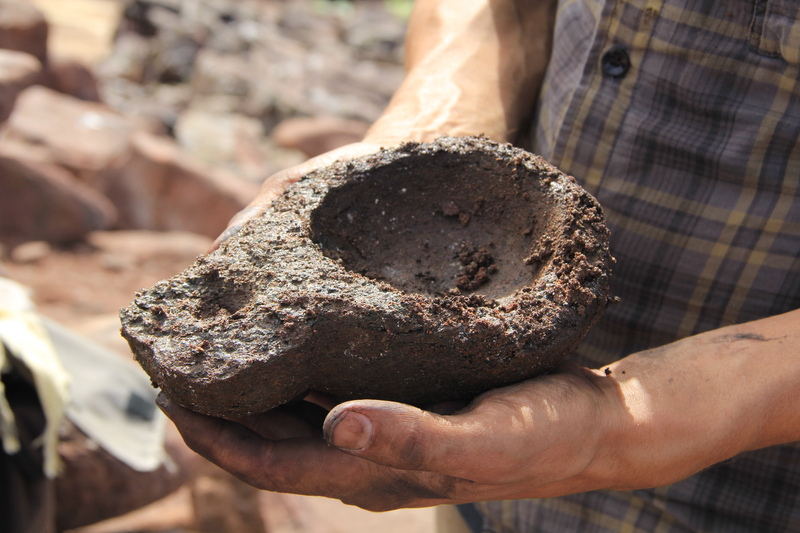 Essentially a large stone with a hole in the middle where a stick could be used for pounding the husks off the outside of barley before it is ground. Interesting enough in itself, but with a hole almost a foot deep and filled to the brim with burned grain, it was an amazing headliner made even more unique in that it appeared to be set into a stone and clay counter to enable working at a comfortable waist level. Wear on the right side may even give a clue as to the user being right-handed. 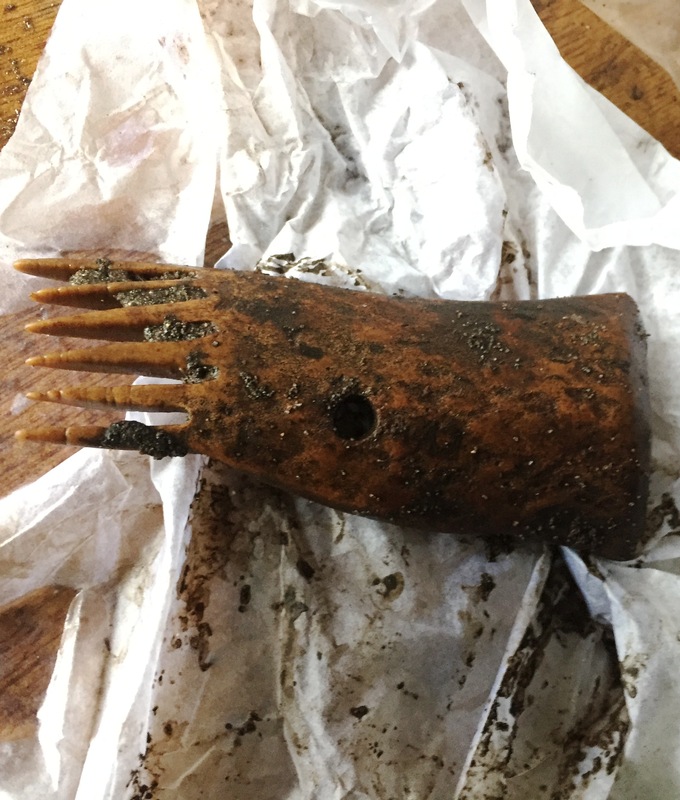 One find doesn’t make an excavation though, so we must also mention three sickles, a saw, an axe, seven querns, a lovely copper pin, some bone pins, combs, spindle whorls, spoons, lamps and that list goes on and on. Some beautiful pieces, I’d like to think some rare ones, but that will be for the experts to confirm. Sickle from Clachtoll. As used by Getafix? My personal favourites are the pumice stones. Nothing much in themselves, but given the notable lack of volcanos in the North West Highlands, they either floated across the Atlantic on the Gulf stream or were traded from a long way South. Having never heard of pumice found on the beaches here, I’d put trade as a firm favourite. 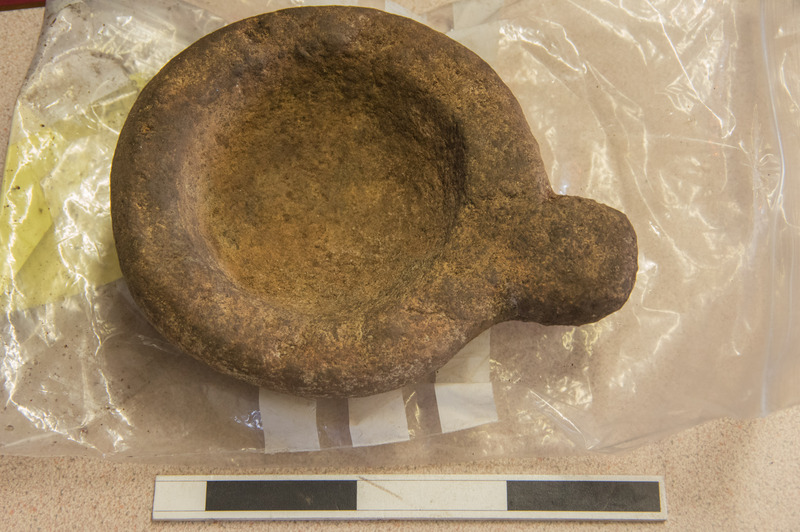 Our pottery finds were all of a type commonly seen on Lewis, though much closer, it is again a sign of either shared ideas or a trade network. 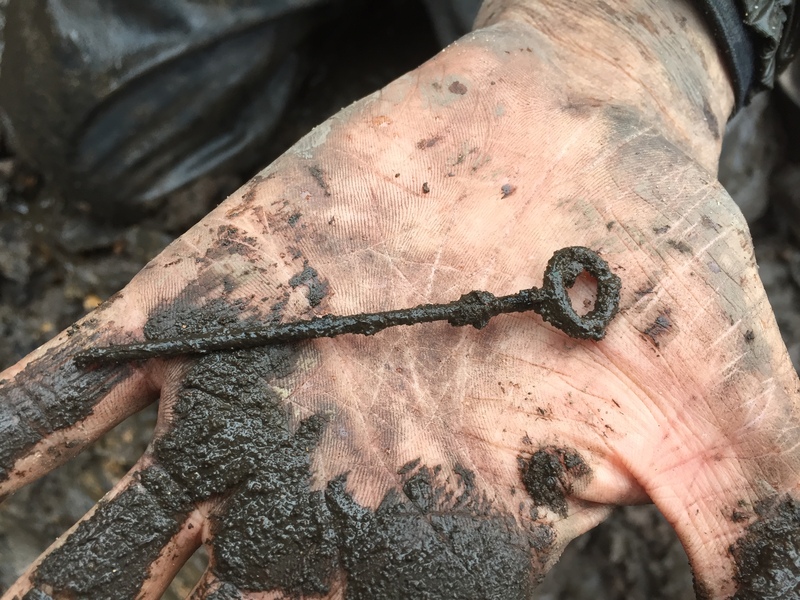 Another little gem was the copper and bronze pin we uncovered. In itself absolutely beautiful, but when you find a pot with curious markings that exactly match the head of the pin, that’s when you have a story to tell! 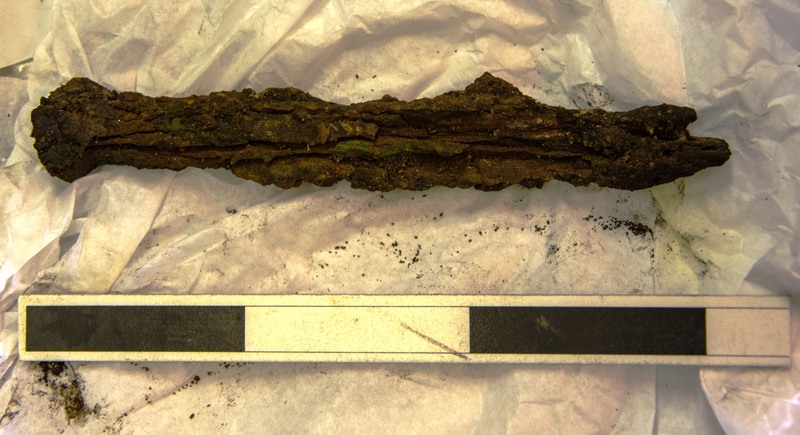 We are not all, of course, focussed on the artefacts (let’s be honest though, many of us are). 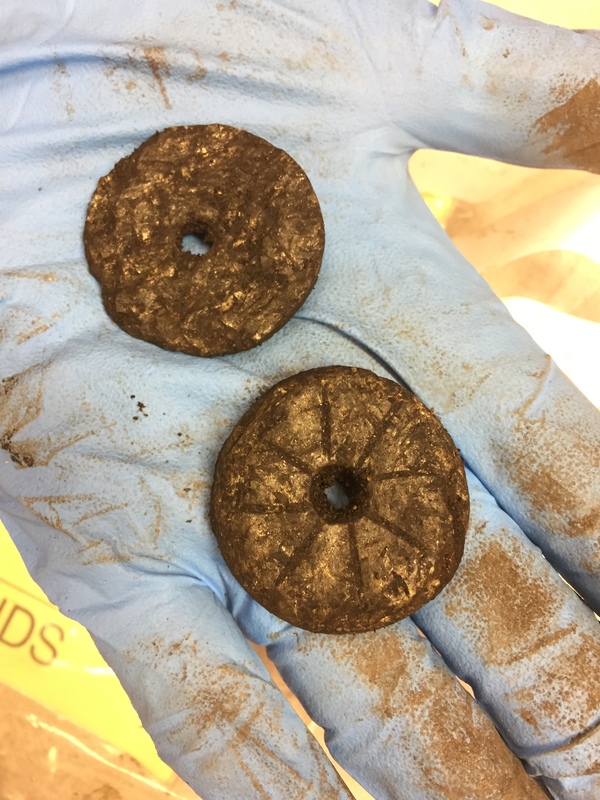 What about the Broch itself? There’s a curious story. We knew it was built on the edge of a promontory. What we have since found is amazing. There is close to a 3 metre drop from the West to the East side. Whomever built it has managed to build a 15 metre high tower in a near perfect circle on a frankly ridiculous slope. All the more amazing when you are on the site and notice that a few metres North (where we had the sieves) is a nice flat area that would have been far better suited to build on. Someone was making a more than a statement. The slope also left us with a challenge on the Eastern side of the building, where there appears to be a souterrain and a cell whose entrance is approximately a metre or so higher. We are guessing there was a floor which levelled off the slope and put a roof over this possible storage area. We’ve learned the building had 3 hearths, one on top of each other. The supposition here is that as time passed in it’s use, new flooring would have been laid on top of old. As the floor piled up, eventually, the hearth would begin to be swallowed, so it too would be enhanced. What this tells us is that Clachtoll was lived in for a considerable time. People worked there, they ground barley and oats, they wove, they span and they did metal work – we have the bloom to prove it. 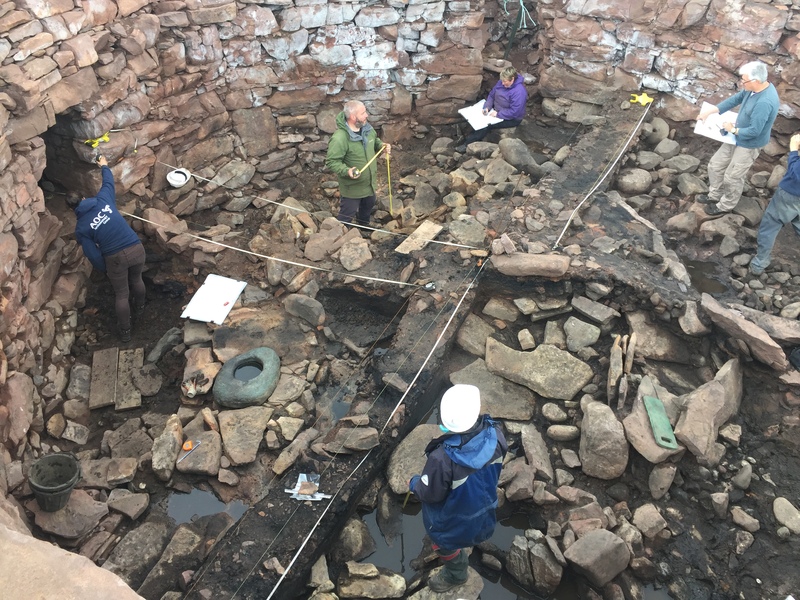 They were extraordinary people building a broch at Clachtoll and with every report back from the archaeologists, we’re learning a little more about those iron age architects. As for those rocks we were shifting in the last blog entry on Clachtoll? To those with weary bones, our thanks! Just under 300 tonnes of rock were hand shifted – Spare a thought for those weary Caereni who had to lift them up in the first place. 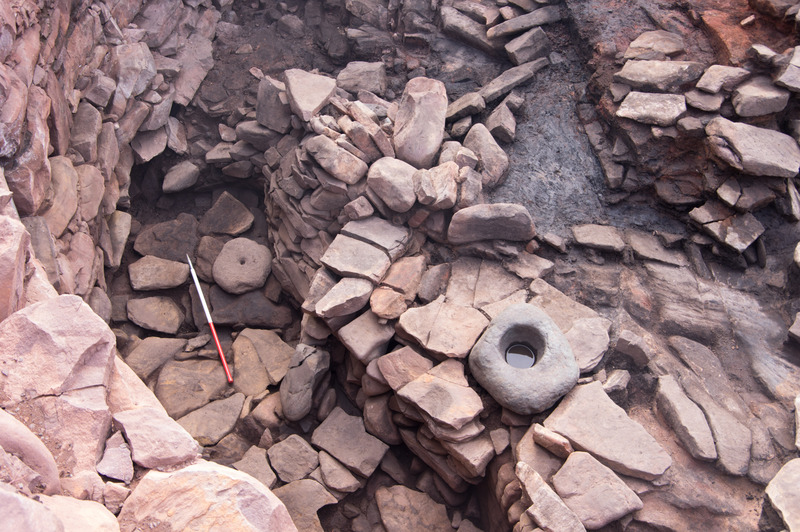 Clachtoll Broch NOSAS Newsletter Article Oct 17 by Gordon Sleight. 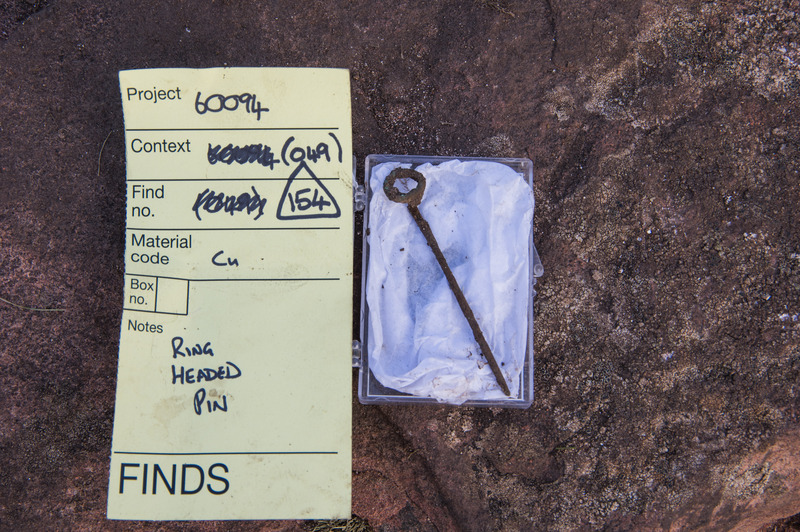 Current Archaeology, ‘Clues to catastrophe at Clachtoll Broch’ 28 September 2017. AOC Clachtoll website and blog. Joffy Hill – Clachtoll Broch Restoration and Excavation 2001. 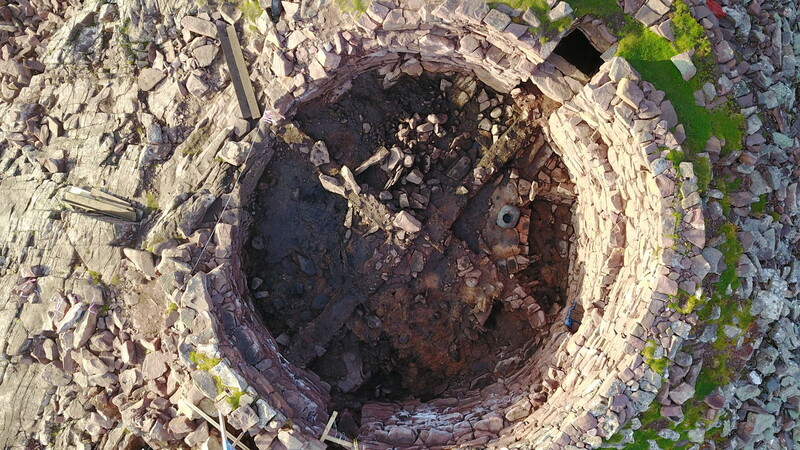 John Barber – Excavation and Consolidation of Clachtoll Broch. 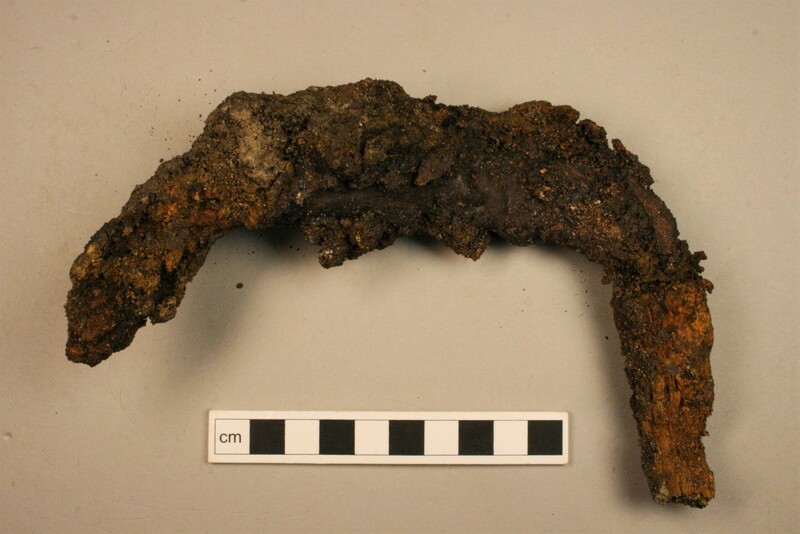 Ring headed pin (AOC Archaeology). Pumice most likely came from Iceland. A lot was washed up on beaches in the 1960s from Surtsey. I live on the Isle of Skye where I am surrounded by Brochs and there is one I can see from my living room window. 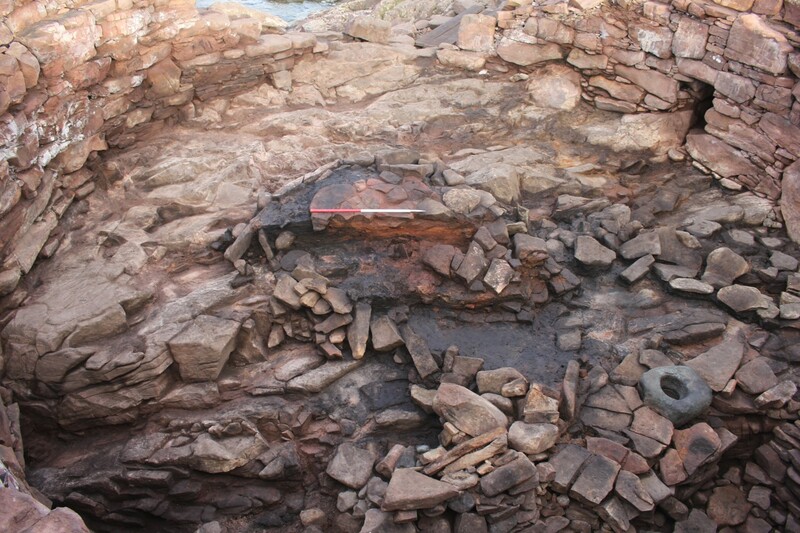 It is great to see a proper excavation of a Broch and I think they all need excavated before they disappear. I was fascinated to see two openings in your Broch, have you any idea why they had two? 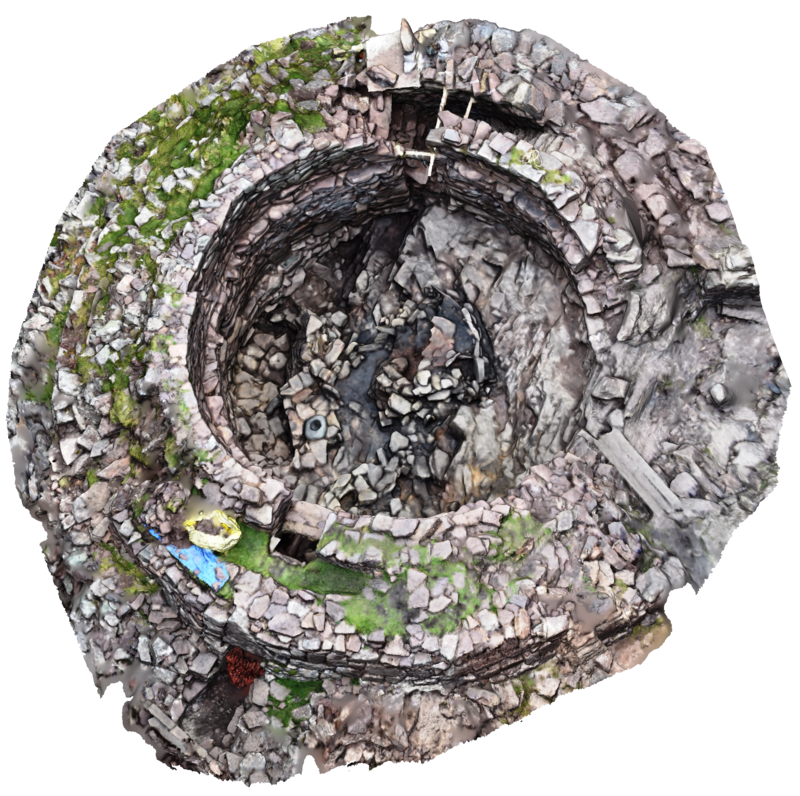 There is a Broch just north of Dunvegan Castle and it has two openings but no answer has been found as the second entrance is smaller 60cm wide 80cm high and leading up to the opening is a wall from the centre of the Broch to first floor height. 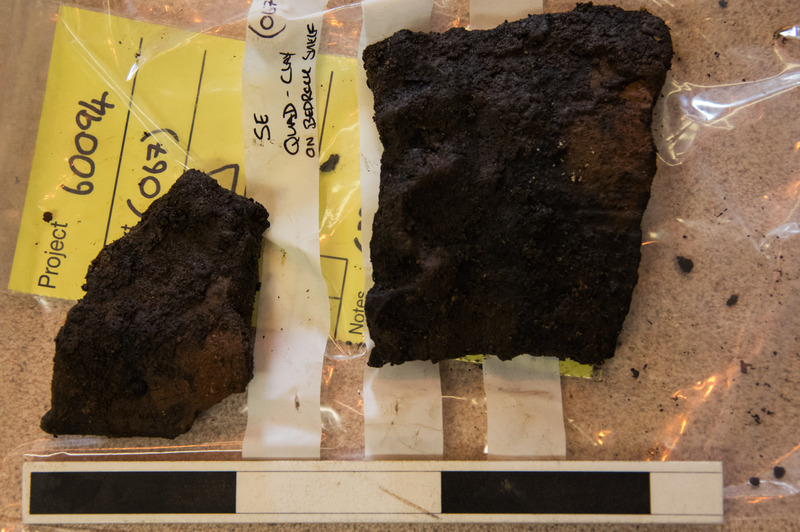 Have you looked for a Broch midden they can sometimes be found outside the entrance? I am researching to find who built the Brochs and have come up with a theory. I started by looking further a field and found myself in the Med Sea area as this was the only place I could find Broch like structures. The first was the Nuraghi towers which I new about but I found Watchtowers in Spain that fitted the shape of a Broch. They are well constructed and look similar in shape and have very thick walls. They were built around 2000bc to alert the coast line of El Argar which was a busy port due to the amount of metal ore mined in the area. I think there is a link between these towers and the Brochs and is due to a time of unrest in the Med Sea area brought on by the Sea People around 1200bc. They attacked El Argar at some time and caused the people living there to escape by boats and headed out into the Atlantic Ocean and sailed North to Britain where they knew the people by dealing in metal ores. The amount of people were too many and could not make home just anywhere without fighting the locals, so they sailed on to Scotland and that is why there are only Brochs in Scotland because it was isolated and barren.